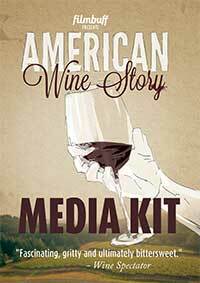 After an upstart winemaker’s untimely death, his sister steps in to try to save his fledgling winery for his eight-year-old son: American Wine Story blends this with other tales of risk and reinvention for those who are born again into the wine industry. This feature documentary is about about the transformative power of a humble beverage to fuel passion and reshape lives. Following dozens of winemakers and aficionados from all across the country to learn what drives them, and also trace some American wine history in the process, this is a film that aims to leave all audiences with a dash of inspiration to follow their own American Dreams, or at least pause and consider the story behind the bottle the next time they pull a cork. This film may make you want to pull up stakes and follow these winemakers' journeys. "Fascinating, gritty and ultimately bittersweet." "The cinematography is stunning. The energy of those interviews...is inspiring." "We highly recommend that you do the following: treat yourself to an Alsatian Riesling and watch American Wine Story"
"This film may make you want to pull up stakes and follow these winemakers' journeys." "If you aren’t inspired in one way or another by American Wine Story, then you might be going about life the wrong way." "Werd ik gegrepen door de film (I was gripped by the film)." @billnanson Indeed - not always glitz and glamour!